Very rarely do I come across a book of any kind that excites me to stop what I am doing and examine from cover to cover with a kid in a candy store enthusiasm, nevermind a cookbook. I might have been hyped up on sugar from the fudge that came with the book (page 312), but once it was open, it still captivated my attention. I navigated the mouth-watering pages from cover to cover taking mental notes of all the food I wanted to try before realizing I really should review this one for you guys. Thank you, Danielle Walker, for writing Celebrations Cookbook to remind all of us that the secret to a happy life is good food, good people, and lots of celebrations. Click on any image to buy the book or click here. Rarely will I make a recipe from another cookbook but Danielle Walker's newest release, Celebrations Cookbook, has inspired me to share this wonderful collection of recipes with you. Rather than just typing, I decided to record a video as well. Enjoy, and comment if you want some more video reviews. One of the most common questions I get asked is why am I not losing weight even though I am eating clean or working out a lot. We as a society are brainwashed into thinking that in order to be healthy all you have to do is eat a certain amount of the right things and do a certain amount of the right movement. Those are marketing dollars speaking that are distracting us from the simple answers we have had all along. Want to be healthy? We NEED to slow down! In my opinion, one problem with food and health today is we don’t cook or eat like we used to. We are all so busy rushing from place to place, task to task, or day to day that we forget how to breathe. The therapeutic process of taking 20-30 minutes to prepare a meal that will nourish our bodies and souls is nonexistent these days. We choose takeout, fast food, or pantry food because we say we don't have time. What we are really saying is that Facebook and Instagram are more important. All of this busyness keeps our bodies operating in fight or flight mode (sympathetic nervous system) from the constant go go go. In order for our bodies to absorb nutrients, heal, and thrive we need to be in rest and digest mode (parasympathetic nervous system). The evolutionary skill built into our DNA to transition us into rest and digest mode is cooking. We should take the time to enjoy the art of cooking and sharing a meal with those we love. No phones, televisions or distractions. Just quality family time in the kitchen and at the dinner table slowly enjoying our meals together which is scientifically healthy. Are you wondering where to start? There is a book for that, it's called the Celebrations Cookbook! It's time to Celebrate with your family, friends, and most importantly good food everyone can enjoy! Don’t forget about the occasions that are all planned out for you with a menu and recipes for a Backyard Barbeque, Birthday Parties, Christmas Dinner or even New Year’s Eve cocktails. You can also mix and match and create your own family occasions using any of the recipes. If you start a new family tradition, leave us a comment below and tell us all about it. And there is an invisible column where every recipe is checked, and it says DELICIOUS! Did I mention that she also provides nutritional information for every single recipe in the book? And not like inaccurate, I don't care about this nutrition information, like REAL nutrition information. Gluten-free, peanut-free, soy-free for sure but did you know that this recipe is also Fish-free. That's great though because fish in Caramel Pecan Sticky Buns doesn't sound that appetizing. I bet some crazy paleo people would add some fermented cod liver oil with cinnamon on this recipe, but I am not one of them. I am pretty sure this book review would be great without that last paragraph, but I am too lazy to delete it so hopefully, you laughed a little bit. I doubt anyone even reads this far come to think of it so I am safe. Celebrations Cookbook is a hardcover work of art that belongs in the kitchen of every cooking human being. I have known Danielle personally since 2011 and I feel incredibly grateful to have witnessed such an incredible journey. I have yet to meet someone so in touch with their gift and so committed and successful in using it to make this world a better place. Alright, it's time for you and me to get cooking. As a special treat, Danielle has been kind enough to share her recipe for Smokey Candied Bacon Sweet Potatoes. When I first came across this recipe I knew it was going down in the caveman kitchen. I also knew that you, my Caveman family would love this one too! This recipe is a delicious step away from the traditional candied sweet potatoes with the marshmallow topping but only if you want it to be. Danielle also included a marshmallow recipe so you can recreate even more traditional dishes during your celebrations if you choose. Savory and sweet pair perfectly in this side dish that is sure to become a family favorite and hold a place on your holiday tables for years to come. Preheat the oven to 400°F. Line two rimmed baking sheets with parchment paper. Cut the sweet potatoes into even 1-inch cubes. Toss them with the bacon, pecans, maple syrup, chili powder, salt, cinnamon, and cayenne in a bowl. Spread in a single layer on the prepared baking sheets. Roast for 20 minutes. Stir and continue roasting for 15 minutes, or until tender. Turn the oven to broil and brown the potatoes for an additional 5 minutes. Watch the nuts closely and pull the baking sheets out early if they begin to burn. Serve hot. As a mother of three full grown boys this recipe sounds about right. Meat and potatoes! They’d be all over this. Love it! Let us know how much they love it when you make it! Thanks, George, for sharing my Smokey Candied Bacon Sweet Potatoes with your followers! So glad you enjoyed them! Thank you for allowing me to share it. I love your new cookbook and know many others will as well! Shared, maybe I won’t miss those super sweet sweet sweet potato casseroles now! shared.. video for free cook books.. so awesome!! Shared today’s George Bryant show and now commenting here. Those potatoes look awesome. I did like you suggested and made a sweet potato chili for dinner tonight. Took about 50 m8nutes start to finish but soo worth it. Now I have a healthy meal for lunch tomorrow. And since the kids didn’t eat it tonight, this will be dinner tomorrow. Woo hoo! I shared your video. Thank you for your review! The recipe looks amazing!! I need this book George! The sweet potatoes looked awesome. I shared video. Thanks! Shared!! Love love your live feeds!! Would love to get your book! Completed! I bought Danielle Walker’s “Against All Grain” when I first started my paleo journey, and I absolutely love her recipes! In fact, I would love to have a copy of her newest cookbook in hand as I prepare to host Thanksgiving for the first time this year! A HUGE thank you to both of you for all that you do! Completed! I would love a copy of Danielle Walker’s newest cookbook. I am hosting Thanksgiving (for the first time) this year, so this would certainly come in handy! Thank you for all that you do! this looks fantastic! Even with pecans, which I’m not a big fan of. But bacon makes everything better! ;) I shared with all my friends. Looks great! Would love to win the book! This book is awesome can’t wait to get it. I love George & his recipes so im positive i will love Danielle Walkers book as well. I shared the video & will be printing & making this recipe this weekend. Thank you to both! Shared the video and will make this for Turkey Day! First of all, I shared the video last night! ? Second, as someone who has many seafood allergies, on top of living in a land-locked town, fish of quality almost impossible to find, so I’m so happy to know there no fish in this cookbook! Third, the pages you shared with us when you got the book, were tantalizing and made my mouth water! Thanks for giving all of us a chance to win a copy! ✌?? Shared and happy to do so ? Thanks for all you do! Completed! And this looks lovely!! Shared video and I love the recipe. Thanks for leaving out the fish. I shared! Loved watching you make this last night George! I have shared on twitter and pinterest. I would love this as I am new to paleo. I have already lost 30lbs. Working on hitting my 155lb goal. Thank you George and your whole team for the commitment you have to all of us!! I love sweet potatoes and bacon. The only thing I would do differently is omit the “candied” part and maybe add garlic! I wanted to thank you George and your wonderful team for being so committed to all of us. This looks like an amazing recipe, thanks for sharing George! First time watching you live! Loved the recipe! I am definitely making this for Thanksgiving. completed! shared and looks amazing! What a wonderful addition to the cooks’ arsenal! Sharing! Great recipe for upcoming holiday season! Can’t wait to try! I am making this right now! My mouth is watering just thinking about it! Thanks for sharing. Looks amazing. I’m not even a big sweet potato fan but I bet I’d love this. Anything with bacon and thick chunks of bacon sound even better. Love Danielle’s blog and recipes thanks! Shares! These sweet potatoes look AMAZING! I’m making them the mid week for sure! I have made this sweet potato recipe out of the Danielle’s Thanksgiving e-book and they are delectable. I actually made my entire Thanksgiving meal from her books and I must say, that even my gluten eating, non-Paleo extended family devoured every bite. The green bean casserole with shallots was out of this world. And George, I am so glad you opted to not throw in some fermented cod liver oil… As yummy as the cinnamon tingle flavor from green pastures is, I am afraid that it would have ruined the bacon flavor ;) see, I read every word. I realize it may be too late to enter for the drawing, that I have invested plenty of time into watching your videos and purchasing your meal planning app as well as purchasing three of Danielle’s books , so I am leaving this remark and sharing the video because I think it is all good stuff. Thank you for continuing to put out the information that you do. I have Danielle’s Thanksgiving E-book and made these, the green bean casserole with shallots and the dressing/stuffing…every single one is TO DIE FOR. Even my gluten-eating, non-Paleo family devoured every single bite. And, George…even though Green Pastures Fermented codliver oil in the Cinnamon Tingle flavor IS good, it would be absolutely disgusting on the sweet potatoes. See…I read the whole thing ? Can’t wait to try this recipe! Love sweet potatoes and bacon! Can’t wait to get her new book! Fish in sticky buns would not taste good, you’re correct. I read that far ? Thank you George for the wonderful review!! This sounds and looks delicious. Sweet potatoes are my favorite food. & The fish free comment made me smile. ? No need to delete a good smile maker. Looking forward to trying this out soon. Smokey candied bacon sweet potatoes. Wow! My mouth is watering. ???? Bacon & Swt Potato, my 2 favs! Can’t wait to get cookin! Shared the video. Looks fantastic. 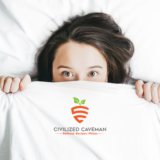 Shared your link….excellent paleo site. Good on you!! Shared and would love to win both books! I didn’t see my post so posting again. Shared video! I would love to win your book and Celebrations. Thanks! I shared your video after a long day driving to Dr’s appointments. I believe it’s time for my family and I to learn a new healthier way to cook. Thank you for all the videos you make, you are an inspiration! Looked so delish on the live stream. Could be the new go to for thanksgiving…sure would love to be a cookbook winner!! This recipe sounds amazing! Can’t wait to get her cookbook! I’m so excited about the birthday section in this book. Struggle for awhile trying to find a fantastic cake recipe. Shared! Can’t wait to try!! Shared the video. Love sweet potatoes and bacon and pecans! Sounds wonderful! Hey George , loved the video!! Shared on FB!! Would love to win a copy of this book and yours. I am getting ready to do an elimination diet – gluten and dairy – so I am looking for a lot of great recipes to try. I also love Against All Grain!! She has so many good recipes , so having her book would be awesome!! Thanks for all you do!! I cannot wait to get this book so I can begin to cook paleo for my daughter and I. Thank you so much George for doing these live videos. Also all of your suggestions for food and wine to buy. I’m looking forward to trying some of these recipes!! Shared the video. I can’t wait for this book to come out! I love Danielle’s recipes! So I have many dietary restrictions and not a lot of supportive family/friends when it comes down to it. As our new family tradition we celebrate ourselves with our own cooking. (with the help of cookbooks) It’s actually a great options for us as we don’t have to deal with the usual family drama. PPS. Please do more cookbook reviews! This recipe sounds so good. I really enjoyed watching you make it. Sounds amazeballs ? also shared the video . Thank you Danielle for creating such a wonderful book. And a big shout out to George for showing us just how easy it cook from Danielle’s book. For someone new to the Paleo world your book is such a treat. Thank you both!! This recipe looks delicious, I can’t wait to make it! Thank you for going live and sharing your knowledge with us! Shared! Would love to win a copy of Celebrations! I love this whole post, but especially the fact that us as a society have lost the art and joy that is cooking a meal for our family. Well said. Can’t wait to check out this book! Shared your live video on Facebook for this recipe. I love your recipes as well as Danielle’s! This recipe sounds and looks amazing and I can’t wait to try it! Shared the video! Can’t wait to try it myself this! I can’t wait to make this, shared your video!! This recipe sounds delicious! I can’t wait to make it! Thanks for going live and sharing with us! Can’t wait to try this! I NEED Celebrations!! I can’t wait to try out these recipes! I really love what you can do with healthy food, and I really love against all grain, too. This recipe looks so delicious! I can’t wait to make it! Thanks for going live to shows us! Shared on Facebook. I can’t wait to try this. Love sweet potatoes. Shared the video! So excited to find a new way to eat sweet potatoes! Also can’t wait to try the cornbread! Love sweet potatoes! Can’t wait to try this recipe! Oh my! I don’t think I can pick just one recipe!! They all sound delicious! The caramel apples sound delicious. 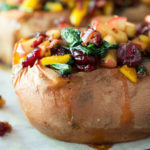 I think I have found my new sweet potatoe recipe for thanksgiving! (Really for any occasion). Can’t wait to get in the kitchen and whip this up. This recipe looks delicious and the cookbook sounds amazing. This looks great! I look forward to trying it! Can’t wait to try the candied bacon sweet potatoes..